The Choirosfagia, an old ceremony that still thrives in many parts of Greece for Christmas table, comes from ancient Greek delivery of Saturnalia. To praise the “God of Sun” Apollo – Mithras, they sacrificed pigs which they consumed as well. The 12 day holiday, from Christmas until Epiphany is, by chance, the same time when pagans celebrated the winter solstice. With the predominance of Christianity, the predominant pagan celebrations and practices were in some way adopted and adapted into Christian traditions as well. The majority of the population were either farmers, shepherds, or lived by the land that their Roman lord provided in exchange of an annual wage or tax fee. There were of course merchants, fishermen, and other urban classes but all of them shared the same religious beliefs. In religious celebrations, the pig of Christmas served as a bountiful meal that filled the table of each family. For reasons of familial economy, households of rural populations that had space, tended piglets until the time before Christmas where they are slaughtered. The season of abundance was always Christmas time in Crete. Each year, the pig of the family offered quantities of meat that was impossible to be consumed during the days of Christmas and for this reason they should find ways to preserve the meat for later. When they slaughtered a big animal they knew that they could not consume the entire animal. The pig is not only an opportunity for big holiday meals but it is meat that will survive for the entire year. Because the goods were not in excess, the people have found ways to preserve the entire animal or parts of the animal for future use in both food and other basic commodities. The skin for example, was used in Central Greece to make shoes, “gourounotsaroucha,” as it is called in Thessaly. The experience of centuries was necessary in order to accomplish it. From the years of Hippocrates people used methods as preservation in vinegar, wine, fat, salt, and honey as it is written in ancient texts of the Greek literacy. Because they had to preserve the carcass, they learnt to use preservation methods with salting, spicing, smoking, and acidification. Products that were made from these processes were: sausage, apaki, tsilladia or pichti, Glina and Syglina, Tsigarides, and the roasted pork which was certainly one of the basic dishes in the festive tables - affixing the needs of the family of Cretan countryside. The communities always worried about the sufficiency of food. To preserve meats the first ever used method was dehydration. They leave the meat under the heat of the sun or the coolness of the air until it dries out perfectly. In the course, salt is added before hanging it for drying. 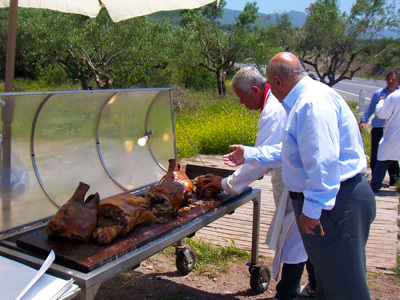 Smoking meat is also widely done on the island of Crete. After initially salting the meat, they put it in vinegar for a certain number of days before beginning the process of smoking. Apaki, is one of the most important traditional foods of Crete. It is prepared from dorsal muscles of the pig. They do not contain fat. Dorsal muscles removed with attention, salted, sprinkled with pepper, oregano, thyme, and other herbs and then is put in vinegar (according to how much vinegar you want to add) for 3 - 5 days. Then placing it in a fireplace to be smoked by aromatic plants and herbs. Sausages of Crete undergo roughly the same process with Apaki but they usually use meat with fat from around the stomach, sprinkled with salt, spices and herbs, then they put it in vinegar. When the process was finished they cut it in small pieces. Then they used these pieces with spices and herbs to fill the intestine of the animal which had been washed and cleaned carefully. Then it is smoked by the fire with aromatic plants and herbs. 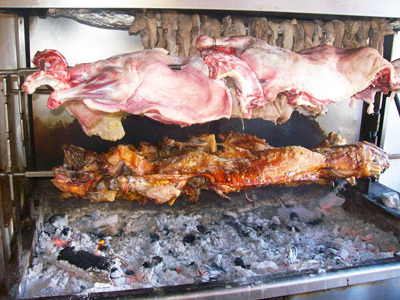 Glina, the lard of pig, is produced in 2 ways. First one is to cut in small pieces and boil it with just water. The fat melts and goes up to the surface. When this gets cold is ready to put it in a plate or to store it for the future. The second way is to place the pieces in a baking pan and is placed in the oven to cook. The fat melts and it is collected after it has cooled. Other preserved foods include Syglina and Tsigarides, pieces of salted roasted brown pork (the Tsigarides are pieces of skin that had been fried) preserved in Glina. Another favorite is the Tzeladia (known today as tsilladia or pichti) and Choiromeri (Gammon - salted, dried, and smoked). 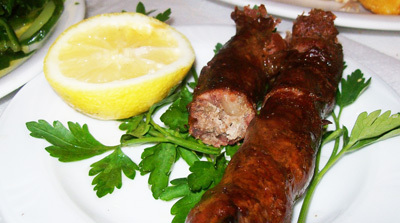 Saltitsounia and Mpoulntounia (sausages stuffed with the blood of the animal) eventually stopped being produced as the Orthodox Church intervened, considering this habit as pagan. 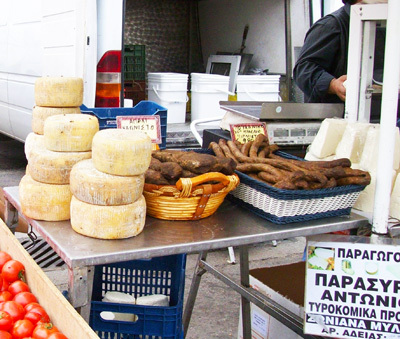 Sausages, Apaki, and Apochtia were the most chosen foods. Rich Foods! 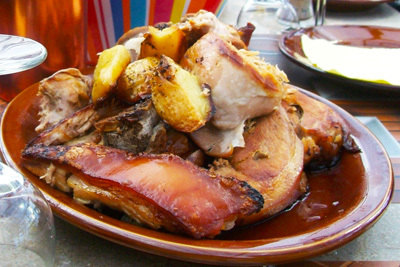 The pork, regardless of the Choirosfagia, is a favored meat and is cooked also regularly. With gentle and soft taste and intense smell, it can be combined with all kinds of spice, aromatics, vegetables, and legumes. For 2 millennia, meat has played a significant part in the life of the ancient Greeks, especially during religious feasts. Giorgos Portokalakis is the author of Cretan Food and Nutrition. This article has been republished and edited by permission. Giorgos or George, owns Porto Club Travel Services and is a partner of BookCulinaryVacations.com​.